It’s time to break the blog silence with some emboss resist and a pretty filigree tree. I created this card quite some time ago and it has been sitting around waiting its turn. 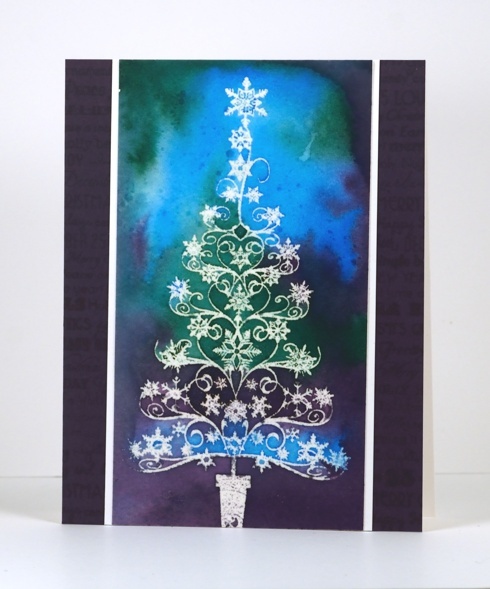 The filigree tree was embossed with clear embossing powder on watercolour paper. The surrounding colour is distress stain painted on and tilted to blend. Once it was dry I added some clear wink of stella to the central sections of the tree for a little sparkle. I then ironed the panel which both flattened it and melted the embossing powder into a piece of printer paper. It doesn’t look that different to an embossed image but surface is smooth so it looks deceivingly clever 😉 To complete the card I added a white mat and a purple border. I also used a large Christmas word background to stamp a tone on tone pattern on the purple cardstock. If you have been thinking about Christmas cards already you might be interested in participating in the Caring Hearts Card drive. You can find the relevant details here. There are contact details for getting involved in USA, Canada and Australia on Vera Yate’s blog. Thanks for dropping in; have a great weekend. Beautiful card. Love the non-Christmas colors. Beautiful, Heather, and I love the dreamy background! Stunning with the tall card, and one day I hope to brave ironing my embossing! Thanks for the inspiration! Hugs! this little filigree tree is so pretty. I love the colors you used. I have to try the iron off technique. this is a lovely card! Wow! Love those rich colors showing off the gorgeous tree! Thanks for the link for the Christmas cards. I need to get some ready to go. Beautiful! Love those colors together, and the white matting on the black background frame it perfectly! Beautiful card! I love how it looks like a shinning tree on a dark night! I do love when a card can look deceptively clever. 😉 The filigree tree with your sponged background is beautiful!